The wonderful Katie at Lustrous Lacquer recently sent me a little bag of goodies for my birthday. (One of the bottles is one I wanted from the moment I saw it, and I'm trying to find the perfect way to show it off to you all.) 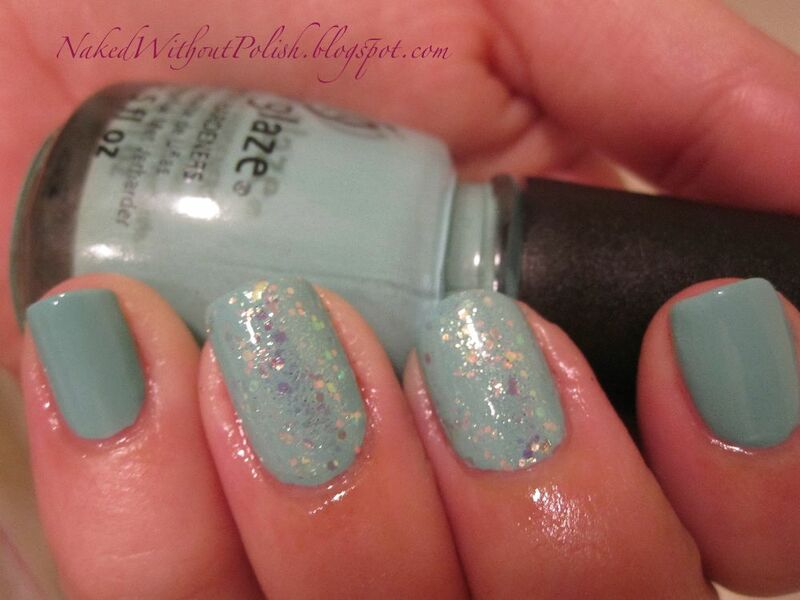 But another bottle that she sent me was China Glaze - Make A Spectacle. I was giddy with excitement when I saw the sparkling bottle in the bag (next to my first ring of striping tape). I've been eyeing the whole collection and hadn't gotten any yet, but what a way to start the hunt! There are so many polishes I could have used with it, but I wanted to keep it in the China Glaze family. Unfortunately, I don't have many China Glaze polishes. I have one creme (For Audrey), two glitters (Make A Spectacle and Lubu Heels) and the rest are crackles that I grabbed at Sally Beauty for practically nothing on clearance. So my obvious choice is For Audrey! This is two coats of For Audrey on all nails and one coat of Make A Spectacle on two accent nails. In love with this pairing! Slightly blurred to see if the shimmer will show more. For some reason it got some bubbles, but it only lasted for a little bit. It even itself out and they went away after just a couple hours. For Audrey is the perfect Tiffany blue and goes on beautifully! So smooth and no issues. Make A Spectacle had a wonderful formula. It wasn't thick like some glitters like this can get. No problems placing glitter. Clean up for both was fantastic! No staining either! All around A+! Can't wait to pair these two together again!